It is impossible to detail the full and rich life of Olga Domanski, who passionately embraced the philosophy, politics and organization of Marxist-Humanism since its inception in 1955. Others have dealt with these aspects of her life, so I will make a few observations not widely known. them to West Virginia, where Olga and I had established a News and Letters Committees local among students and coal miners. In keeping with our perspective and emphasis on workers, Raya’s idea was to have miners read them, then set up a meeting to have a full discussion. We had several dozen miners at that meeting. 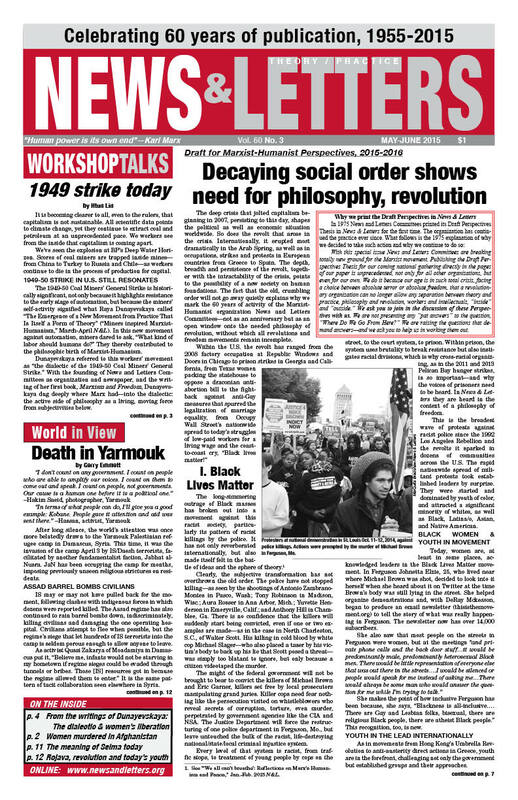 When the book was published, the Local scheduled classes on it and reached the concept of “transformation into opposite.” The college students saw it as an abstraction that they didn’t understand whereas a miner said, “You mean like a guy who is a good union fighter, and is made a boss, then becomes a real slave driver.” What was an abstraction to the students was a common concrete experience to the miner. Olga never tired of telling that story. 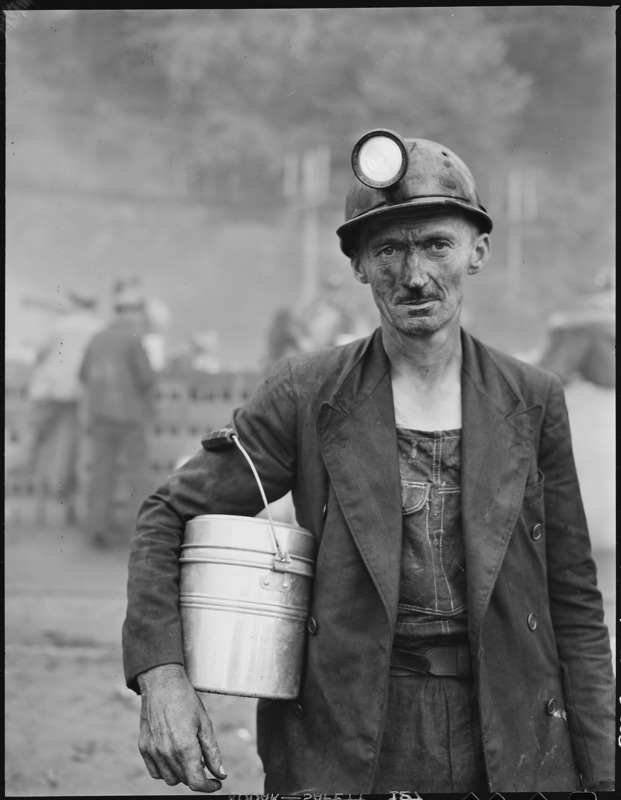 Coal loader in Appalachia, 1946 Photo credit: Wikipedia. Olga worked daily with Raya, yet was always there for our daughter, Erica, whether it was a major activity in kindergarten, grade school, junior high school, high school, college, getting her doctorate and throughout her life. Of course, it helped that Olga had an understanding “boss,” Raya. During the last years of Olga’s life, Erica reciprocated by providing Olga all that she needed. Olga also handled all of the family finances. All I did was give my paycheck to her. Many times that paycheck was very meager, especially when the mines were working only one or two days a week or I had a job making so little that she had to temporarily go to work. It always amazed me how much she could do with so little. Before she died, Olga gave instructions on what was to be done with her remains: her body was to go for medical research, the unused parts were to be cremated and buried next to Raya, with a tombstone inscribed “I helped Raya.” In death as in life, Olga will be close to Raya—in perpetuity. Editor’s note: Below are excerpts from a longer poem. We—Amy Garrison and Brown Douglas—met each other in Memphis in the early 2000s as young radicals intent on learning revolutionary ideas. One of us was involved in News and Letters Committees as a Youth columnist, while the other was an enthusiastic friend of the Memphis Local and briefly a member. We knew Olga from national gatherings and from the many correspondences we had with her in the course of being active with the Committees. Olga was not only very fond of the youth in News and Letters Committees, but really any youth that came around who wanted to talk seriously about ideas. It was no small thing to know that Olga was on your side: here’s this revolutionary who was there with the Johnson-Forest Tendency, and there as a founding member of Marxist-Humanism, and she intently wanted to know what you thought about something political or philosophical. It was fantastic. Any importance associated with our age differences dissipated as we became friends and comrades. Olga made us feel like we mattered, and warmly so. At the end of every national gathering, she addressed the room and told us how precious Marxist-Humanists were, as we were comparatively few but passionate about our unique concept of freedom and revolution. We want to make sure everyone knows how precious Olga was to us and how grateful we are to have known and worked with her. I remember going over to Raya Dunayevskaya’s house in Detroit many times and seeing Olga and Raya working on a set of minutes or a draft chapter of one of Raya’s books. Olga was the secretary for Raya. Others served as secretaries, but it was Olga who was central to helping Raya with so much of her trilogy of revolution, the collection of writings on women, the vast output of letters often dictated, the Political-Philosophic Letters, and on and on. Olga was a secretary, who was a philosophic-political-organizational colleague and comrade. To subscribe to News & Letters click here. When I moved to Detroit to work on News & Letters, I went with Olga to the print shop to work on the final check of the paper before it was printed. Then newspapers were set in lead type and Olga had a little mirror with her in order to read the last corrections to the lines of type. It was part of Olga as the most organizational of persons. She kept the books, organized archival material, prepared the monthly mailing of the paper, and more. So much of the organizational life of News and Letters Committees depended on the Herculean labors she undertook. The more than a quarter-century of News and Letters Committees post-Dunayevskaya has not been easy. But where would we be today without the hard, creative labors of Olga? When little sects emerged and tried to destroy the philosophical-organizational heritage of Dunayevskaya’s Marxist-Humanism from within, it was Domanski, as organizational secretary and her colleagues, who fought to continue and develop the body of thought and organization. With all this, she still found time to enjoy little pleasures. I joined her for a walk among wildflowers one Sunday afternoon in Chicago; and listened to her talk about the choral group she participated in. Olga, a crucial, wonderful Marxist-Humanist revolutionary. When I think about Olga I am reminded of her strength. She was a tough woman in a great way. You could question her knowledge and she would tell you exactly where it came from. She liked people to figure things out for themselves. When I first joined, she scared me a little, but I came to appreciate that toughness. Her passion for the organization never faltered, and she expected us to act the same. One time I was going to write something for the paper, I asked her for help. She looked at me for a few moments and said, “Suzanne, you want me to do your thinking for you also?” I will never forget that. REST IN POWER, OLGA. Olga’s enthusiastic greeting to me was, “My Polish girlfriend!” We both understood she was recognizing the revolutionary dimension of the Polish struggles: whether during the U.S., French, or Haitian Revolutions, the Paris Commune, or contemporary struggles such as the Solidarity movement in 1980- 81. She edited my article on women in the Solidarity movement in such a way that not only did they present what was revolutionary to an American audience, specifically Western feminists, but was illuminating to Solidarity activists plagued by the question “what about women?” The Women’s Liberation Movement was an idea whose time had come, as Olga used to say, and male Solidarity activists did not know how to answer it. Olga’s affinity with Polish revolutionaries arose from her own conviction of the universality of liberation. When talking about her participation in the Civil Rights Movement, she recalled why she was involved. She would explain that racism not only hurts the people it’s turned against, it also harms the racists, preventing them from realizing their humanity. The struggle against racism was, for her, not just a struggle for someone else’s freedom, but for the possibility of her own development as a fully realized person. She practiced the idea of freedom as not only existing “out there,” but as needing explicit development in each one’s life. Her contributions will not be forgotten, but her presence will be missed. Please see enclosed my check for $50. Olga’s life was spent in keeping News and Letters Committees and the Raya Dunayevskaya Memorial Fund going. I know that if her death meant that people would send you money, she would be delighted by that aspect of events. Money to her was always a question of human relationships. Please accept this donation in that spirit, knowing that as long as Marxist-Humanism has actual people taking responsibility for developing it, Olga will always be with us. Because of the desire of others to share their memories of Olga, our memorial to her will continue in the March-April issue, so there is still time to send your thoughts. 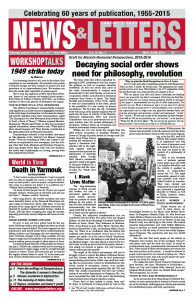 This entry was posted in Articles and tagged Amy Garrison, Andy Phillips, Brown Douglas, Chicago, Civil rights movement, coal miners, Detroit, Erica Rae, Eugene Walker, feminist, freedom, French Revolution, Haitian Revolution, Johnson-Forest Tendency, Marxism and Freedom, Marxist-Humanism, Memphis, Natalia Spiegel, News and Letters Committees, Olga Domanski, organizational, Paris Commune, passion, Poland, Political-Philosophic Letters, racism, Raya Dunayevskaya, solidarity, Solidarnosc, Suzanne Rose, trilogy of revolution, Urszula Wislanka, West Virginia, women's liberation movement, youth. Bookmark the permalink.